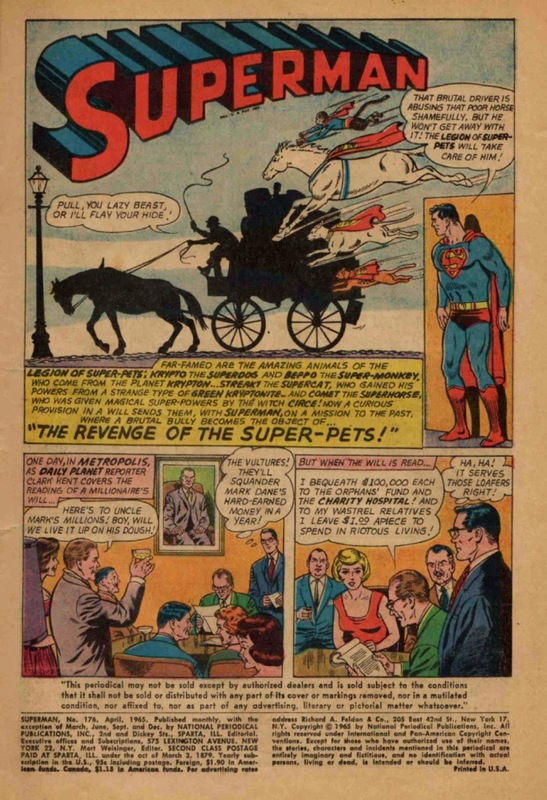 Here in the middle of the first story of Superman #176 from 1965, the time-traveling Superman and Super-Pets have discovered a man whose every conduct is animal-UN-friendly. 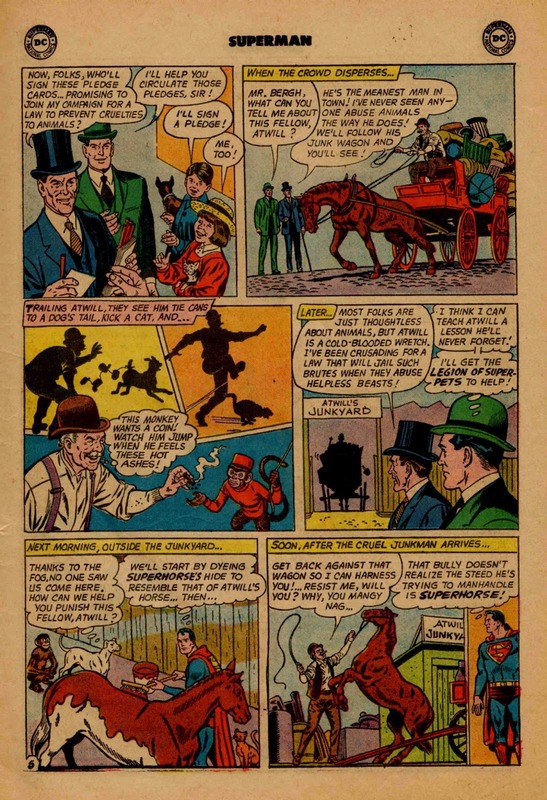 He is nearly counterbalanced by a gent named Henry Bergh, who is a voice for humane treatment of animals, including the circus beasts where Kal-El and company (undercover as Superb-O and his Performing Animals) are basing. Bergh and Superb-O have just relieved the plight of a bunch of pack horses, and Bergh's trying to raise money for a fund to take care of all mistreated critters. This while they observe Atwill, that lovely example of humanity, get his kicks from all sorts of low-down behavior. BTW, the dandy in blue attire is Bergh; the guy in the green suit is our leading man, Kal-El -- I mean Clark Kent -- I mean, Superman -- I mean, Superb-O. Now comes the part of the story that will satisfy the heart of every kid who wanted to stand up to a bully. This particular situation seems worse, in that the animals being mistreated CAN'T stand up for themselves, and are pretty much helpless unless another human comes to their aid. Or, unless some Super-Pets chip in! 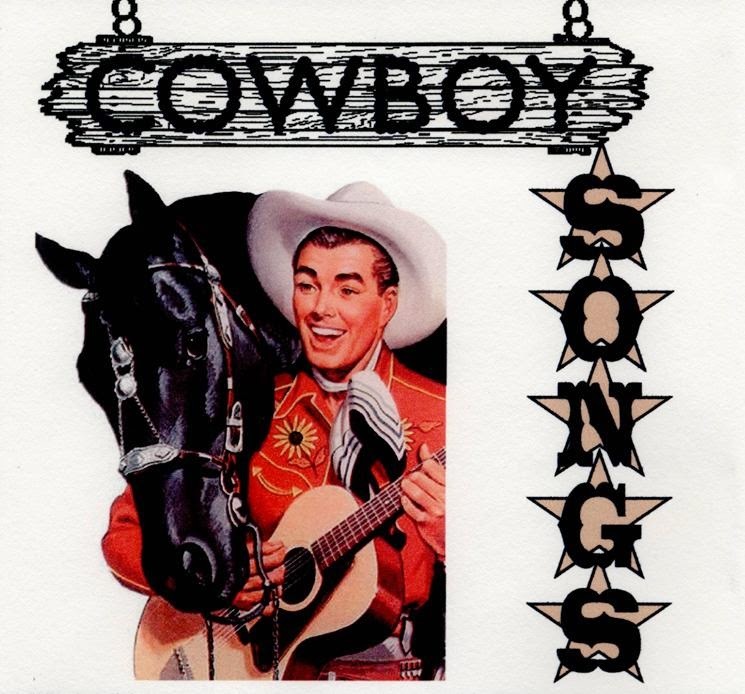 First up in the re-education of Cyrus Atwill: A wild ride with Super-Horse! Up in the air, Junior Junkman! Next, Atwill figures he'll cream that dumb ol' dog standing next to the junkpile he's collecting. Hmm. The dog doesn't yelp. The scrap iron Atwill throws breaks and bounces off, while the dog stands there like a ... like a ... like a STATUE! Man, that is some "special, quick-drying cement"! Of course, it had super-breath helping it set. It's a good thing that Streaky's powers are still "on." Otherwise that tar, and its removal BY HEAT VISION might have been a little painful. I invite you to join me in a celebration of true love, the great open pre-cluttered American wilds, and a fair helping of corny lyrics. Since a few of these are recordings of radio shows or other semi-lo-fi media, there is some hiss or background noise present on some tracks. Still, if you have half of the fun I have when playing these songs, you'll be satisfied, and maybe in love with your horse. For a news story, Clark Kent is attending the reading of the will of super-rich (dead guy) Mark Dane. So far, Dane has given $100K each to two children's charities, and ONE DOLLAR EACH to his leech-like relatives, who'd been hoping to live high off the uncle's dough. Now we learn that the estate's remainder, some two million dollars, is to establish a shelter for homeless animals, to be administered by The Legion of Super-Pets. This bunch of critters was first assembled in Adventure 293 in 1962. Comet the Super-Horse, once a centaur named Biron but now a telepathic horse with super-powers. He's one of Supergirl's critters. His Bronco Bill persona does not figure into this tale. Streaky the Super-Cat. He's a stray befriended by Kara while she languished in the Midvale Orphanage. You see, she was performing chemical experiments to try and make Green Kryptonite harmless. One of her (unsuccessful) samples was encountered by Streaky, giving him on-again/off-again super-powers. Beppo the Super-Monkey. 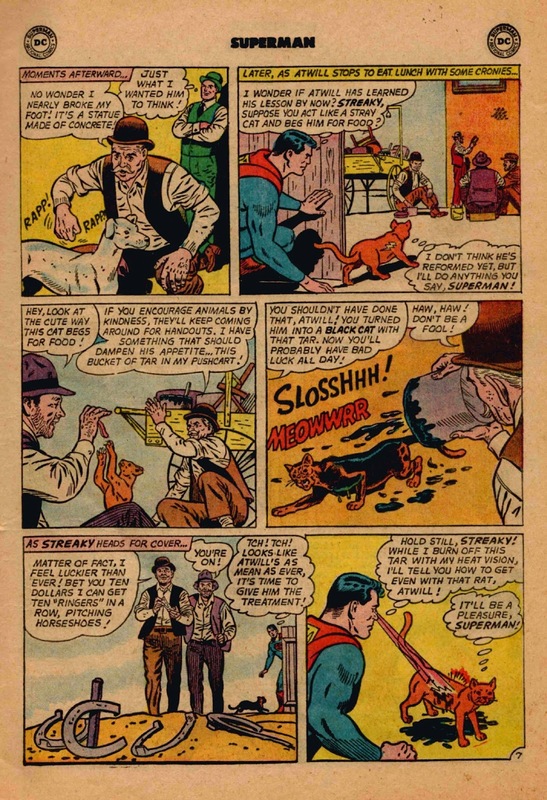 He first appeared in 1959's Superboy #76. Turns out he is one of Jor-El's experimental animals who had the good luck to stow away in a rocket that happened to carry baby Kal-El to Earth. 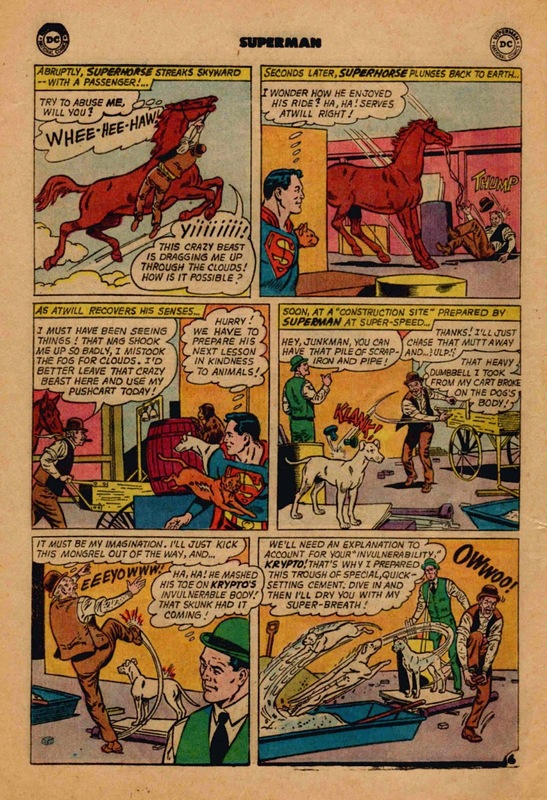 Krypto the Super-Dog is the original super-pet. He was sacrificed (thought at the time) to an experimental Kryptonian rocket launch during Jor-El's research to save his son (and wife) from Krypton's KA-BLOOIE! His rocket drifted to Earth eventually. 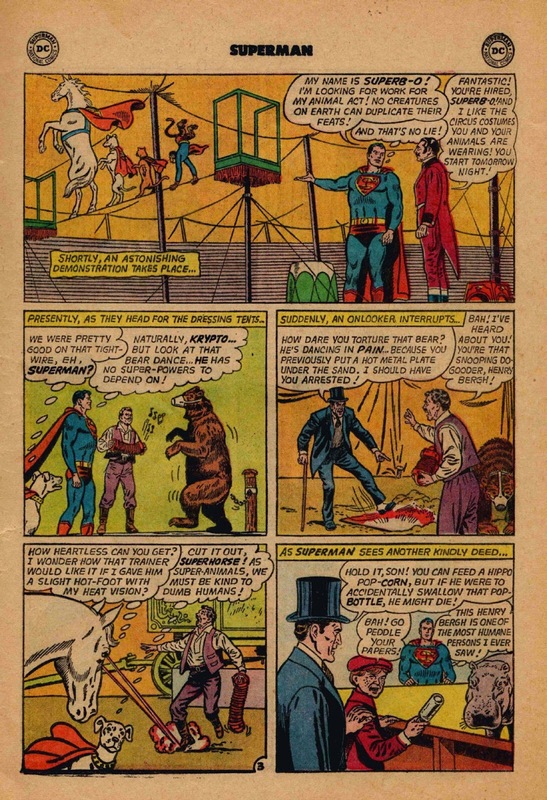 Now Superman decided to take the Super-Pets with him to Metropolis the 1860s, to discover Mark Dane's history, and to try and figure out the origin of his obvious devotion to animal welfare. As noted, Comet is already telepathic. The others have been given a brief "tele-charge" by the Legion of Super-Heroes' Saturn Girl. As they head to the past, all they know is that Mark Dane's largess is motivated to atone for the anti-critter sins of his uncle, Cyrus Atwill. So, the Super Team Five will look for him. A smart and hide-in-plain-sight idea. They're an animal-performance act ! This explains their greater-than-normal intelligence and (sometimes) their super-powers. While they haven't met the beastly (ha-ha) Cyrus Atwill, they encounter plenty of cruelty to animals, and encounter an animal lover, Henry Bergh. What's great about the way this story is handled is this: It depicts thoughtless acts and their possible outcomes, as just a dangerous as intentional cruelty. Case in point: the kid about to throw a bottle at the hippo. He's a little twerp and doesn't really care about the hippo, but we young readers learned from scenes like this that bad things could also happen unintentionally. And don't you love Comet giving the bear "trainer" a taste of his own medicine! "We animals must be kind to dumb humans!" Krypto reminds him. We finally meet Cyrus Atwill as Henry Bergh demands that Atwill show his tired, beat horse a little kindness. Not only kindness, but it only makes economic sense to take care of your work animal, I'd think. Keep this one going -- it's gotta be cheaper than having to buy a new horse! Pretty tricky how, after mean ol' Atwill shuts off the water valve, how Superb-O (note it's one letter away from "superboy") manages to turn the water back on! Already we can see Bergh as a hero, and Atwill as the heartless wretch that he is. Now that Superb-O and Bergh have officially met, and we've encountered the black heart of Cyrus Atwill, what will happen next? 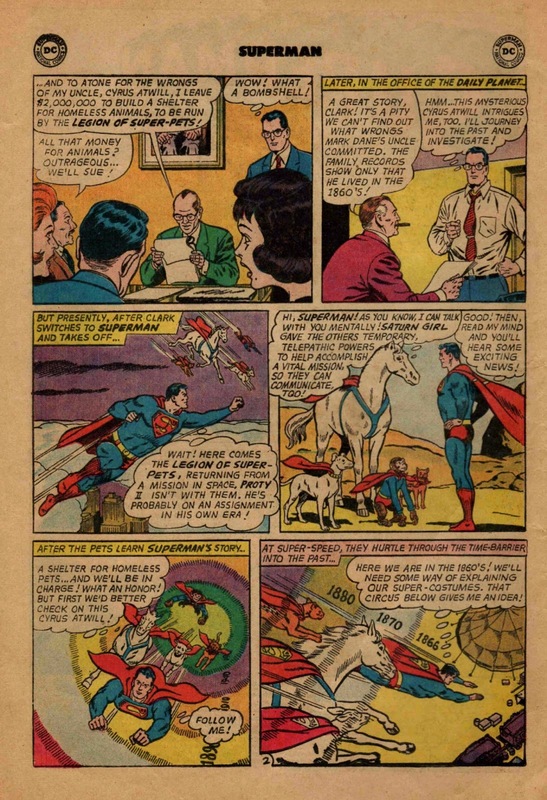 How will the Super-Pets help Superman even the playing field? Tune in on Friday for the next instalment of this tale! Tomorrow come back for another of my music compilations. When you consider that dozens of comic books were published monthly by several comics companies, and that each concern cranked this stuff out eight or ten times a year .... it amazes me that this "product" had so many good stories and art. I'm not talking the Louvre or the MOMA. I'm just talking about competent plot assembly, characters that look consistent when drawn from various angles, and (usually) a glimmer of genuine human reaction or motivation. This kind of "everyday genius," as I call it, is also present in most old buildings that were built more by hand than by machine; in furniture or toys or other items that were well-designed. A 1962 Chevy Impala or 1968 Ford Galaxie is a thing of beauty and a joy forever! 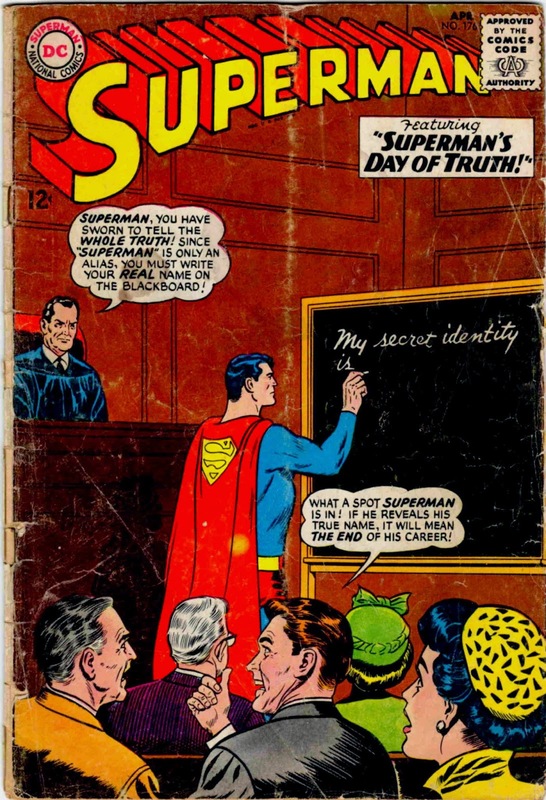 So for the next few weeks we're going page-by-page through Superman #176, cover-dated April, 1965. I would have been about nine and a half years old when it hit the stands in March or late February 1965. This may have been an instance of a cover scene being concocted and then assigned to a writer. Still, even a nine-year-old thinks this is a dirty trick. Here we have our hero in a jam. He has come to this court room and was sworn in (we assume) to put some lowlife crook away. Now here out of left field, the judge is ordering him to reveal his Secret Identity? OBJECTION, YOUR HONOR! Relevance? 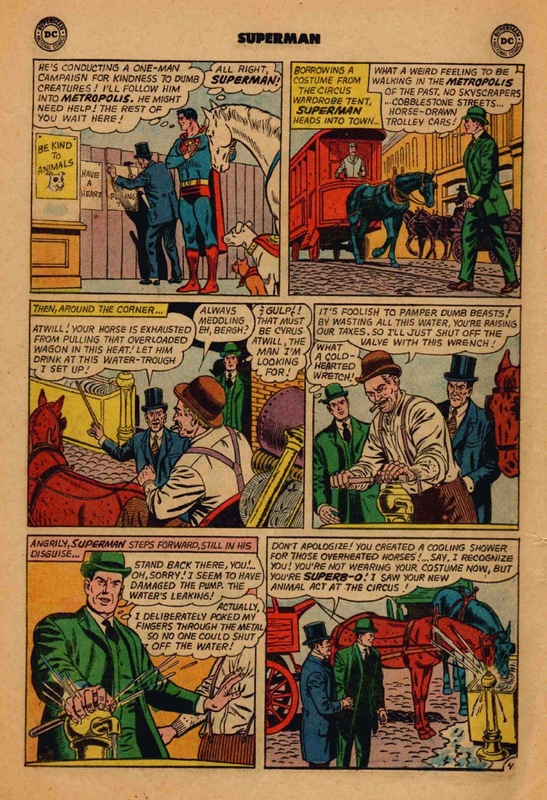 Superman has been deputized under that name as a law enforcement agent for the entire membership of the United Nations, as well as the Metropolis Police. Any further explication of his identity is irrelevant to his testimony, and may predicate acts of revenge upon his acquaintances, in the same way that a secret witness's family is endangered when someone in Witness Protection is exposed. This full-page ad was the inside cover of the mag. 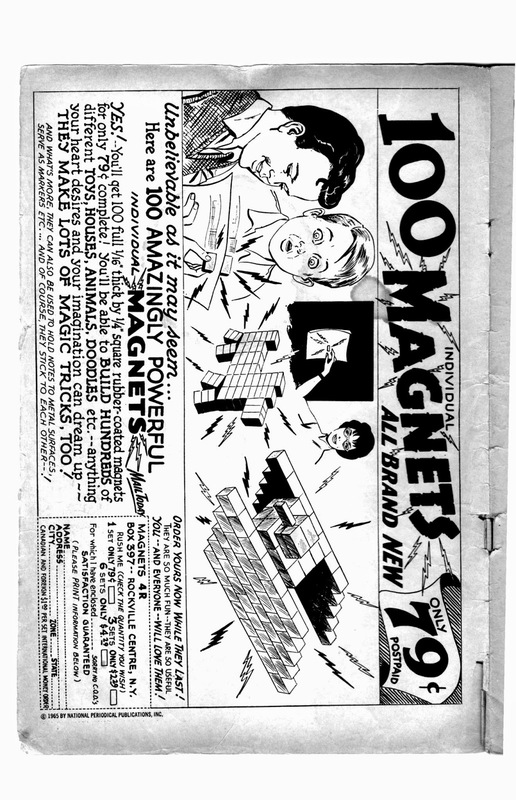 Evidently, children of the 1960s were a lot less likely to swallow tiny magnets. Other factors include the likelihood of (comparatively) closer supervision by parents or siblings, and the fact that generally, society was expected to conduct itself with COMMON SENSE. If you deliberately tried to use a consumer item in a damaging way, then instead of a financial windfall through a lawsuit you might be laughed off the playground. Of course, BB guns could put out an eye or you could break your leg tree climbing; but to deliberately try to get damages from the manufacturer of a fun product? That's un-American. "The Revenge of the Super-Pets!" Comic Vine reports that this story was written by Leo Dorfman. We can all see that the art is by Superman master Curt Swan, inked by George Klein. This first of three stories is a morality tale whose main characters are the Super-Pets. They're going to travel back in time with Superman to check out a one-man wave of animal cruelty. Clark Kent is covering the reading of a millionaire's will, as his vulturous would-be heirs salivate. Don't you love the tag at the end of the will, in which Dane leaves these weasels $1 apiece to use in riotous living? If you read the indicia at the bottom of the page, you will see that this comic is published eight times a year and that a subscription would cost you 95 cents. A YEAR OF FREAKIN' COMICS for less than a dollar! Outstanding! Of course, that same dollar would probably buy you four gallons of gas or movies and hamburgers for two. More of this story and this issue on Wednesday, see you then!